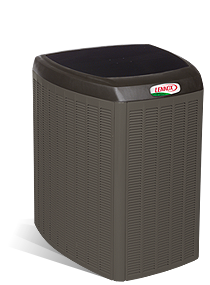 This small and compact Heat Pump is small enough to fit in tight spaces near patios and decks, but strong enough to provide good quality cooling and heating all year round while saving on energy. 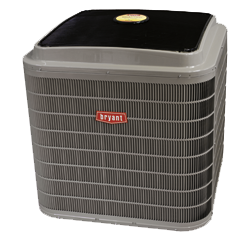 The Bryant Preferred Compact Heat Pump is easy on the environment with both its noise levels as well as having refrigerant which is environmentally friendly. 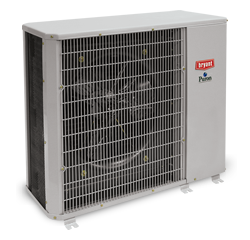 Ultra compact for small spaces which means that no matter what the size of your home is, you will have good quality heating and cooling without having to work around a big Heat Pump unit that is more in the way than a benefit. Up to 15.5 SEER which is how the energy efficiency of the unit’s cooling power is measured. The higher the SEER number, the more efficient the unit is. 9.0 HSPF which is the heating efficiency of the Heat Pump. The higher the HSPF number is, the more efficient the unit is at heating your home. Sound as low as 66 dB which is quieter than a conversation. This gives you the freedom to speak to someone where ever you are in your home and not have to try to speak over the noise of your Heat Pump. DuraGuard Plus protection system which ensures that your outdoor unit will last so much longer because of the protection it lends to the unit from the outdoor elements in even the harshest climates. Blow – through design which supplies a constant flow of hot or cold air depending on your needs instead of shooting sudden bursts of hot or cold through the home to keep your home at a constant and comfortable temperature. Environmentally sound Puron refrigerant which is ahead of its time as it does not harm the earth’s ozone layer and complies with the Federal Law that will be passed in the next few years already. 10-year parts limited warranty upon registration which gives you the confidence to use your unit without being concerned about it failing after a few years. 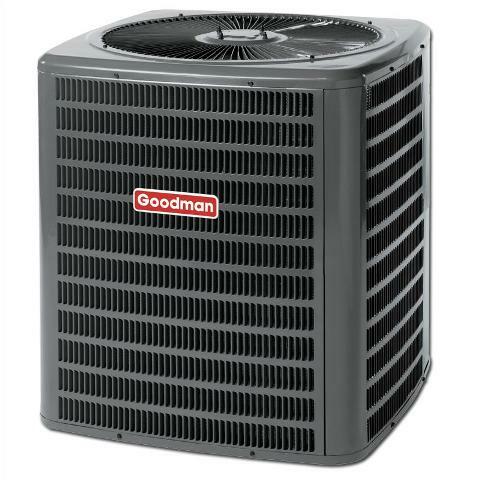 Efficiency of up to 15.5 SEER and 9.0 HSPF which gives you more heating and cooling power for your money and saves you on heating and cooling costs to give you affordable comfort through the year. This product is covered by a 10 year parts limited warranty once registered. 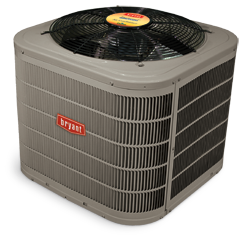 The Bryant Preferred Compact heat pump also meets the ENERGY STAR guidelines for efficiency. Quiet running efficiency at a noise level of as low as 66 dB which gives you the freedom of heating or cooling your home without the industrial noise levels of some heat pump units. Compact Cabinet design which gives you the benefit of installing the unit in even the smallest spaces. Supported controls include the Thermidistat, and the HYBRID HEAT dual fuel thermostats which gives you the control of your heat pump to customize the unit to your unique needs. Environmentally-friendly Puron refrigerant which means sustainability and safer living for you and your family. Split system with outdoor unit connected to the indoor unity by copper tubing to carry the refrigerant between the two units. Easily identifiable parts with serial numbers for registration of the unit. This unit also features a scroll compressor which works in a circular motion. 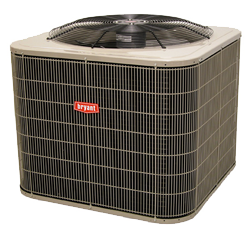 You can consult the Consumer Brochures and Owner’s manual for more information about taking care of the unit as well as information on maintenance and troubleshooting. 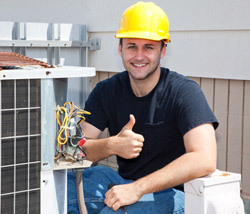 The unit needs to be installed by a professional and authorized technician for the warranty to be honored. 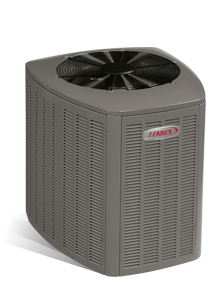 The unit needs to be registered within 90 days of the original installation of the unit otherwise a limited warranty will be applied. If the date of purchase cannot be established then the 90 days waiting period will apply from the date of manufacture of the unit. Where the unit was installed in a newly built home, the 90 days waiting period will commence on the date the owner of the home purchased the home. There is a limited 10 year parts warranty for the original owner of the unit. Should the unit not be registered within the allocated time limit, a 5 year limited warranty will apply on the parts. Should the unit be converted in any way or enlarged or used for any purpose or in any way other than stated in the owner’s manual, the warranty will not apply. An extended warranty is available from your supplier in store.